In Sydney there is a valet check in service for Business Class travelers, but because I arrived by taxi I didn’t use it. The normal Priority Check In was empty as usual, and I’m checked in and my way to the Lounge in no time. I love the Virgin Australia lounge in Sydney. It doesn’t seem to matter how crowded and busy it is it always seems quiet and is always immaculately tidy. I don’t bother with the celebrity chef Luke Mangan-inspired menu on offer, preferring to wait for breakfast on the plane, but a barista coffee certainly goes down well. When it’s time to board, the priority boarding has me seated in minutes despite the plane looking like it’s going to be pretty full. On the return leg, the Lounge in Perth is almost deserted, and no less comfortable. 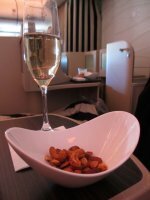 A much smaller range of food options is available but for a midday flight is not a problem. First surprise comes before we even push back – I’m presented with a very international flight looking amenities kit, that would put many international carriers’ business class amenity kit to shame. I’m instantly in love with the delicious orange scented hand cream. Completing the kit in addition to the usual eye shade and ear plugs is a facial moisturiser, a good size tube of toothpaste and toothbrush and a little hairbrush. Seats are roomy and comfortable with plenty of space between rows. 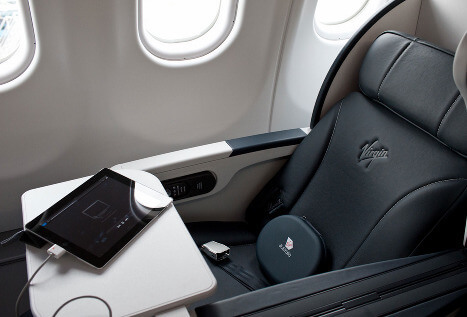 I don’t put my seat all the way back, but I note on the Virgin website that seats are lie flat. Pillows and blankets are good quality and consistent with a Business Class offering. I manage to fall asleep for an hour on the way home, with the seat just on a semi recline, so all in all, I think it’s a good seat. Service is the usual bright and breezy, chatty Virgin Australia service, with an extra attentiveness compared to Economy. An inflight menu of the Luke Mangan breakfast options is delivered, and a good variety of options it is. Three or four completely different choices, including a vegetarian option are available. I elect for the sausages and Luke’s own baked beans, and while both are pleasant, are nothing to get excited about. On the return leg I go for the lamb shanks, and am very impressed with their genuine restaurant quality taste and presentation. Good quality china, cutlery and glassware make dining a quality experience and the prelunch option of champagne, wine or a mixed drink adds to the International Business Class mood of the inflight service. It’s the entertainment that lets the inflight experience down. No VOD, and a fairly limited range of choices, based on a small number of Foxtel pay TV channels. I find a couple of things to watch, but then read the rest of the time. Bathrooms are kept spotless throughout the flight. On the flight back to Sydney there are only three of us in the Business Class cabin, so we are requested to use the Economy loo so the front of plane ones can be closed. No queues and still lovely and clean, so there’s no problem doing that. I have to say, I do like the Virgin Business Class offering on the A330. 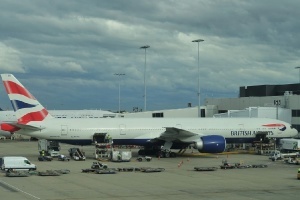 It really is an International style experience, even on a domestic route. 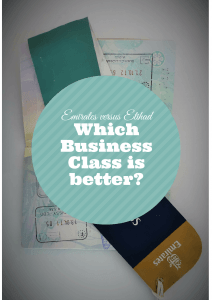 I understand this is the same service and amenity Virgin has on the run to Bali, so the obvious question is, how does it compare to the Garuda Indonesia Business Class that I reviewed last year? Well, there is no doubt it is better, but it is significantly more expensive (depending on discounts, up to twice the price). Whether it is worth twice the price, I’m not sure. Having said that, if I’m off to Perth anytime soon it would definitely be my choice. Disclaimer: the author booked and paid for her own ticket for this flight. All opinions are her own. Photo credits as listed. You were in Business Class and they “closed” that lavatory, telling you to use the ones in Economy? I would have politely told them where to go. This was downright flight attendant laziness, I wouldn’t have stood for it. Wow, that really makes me speechless. There was only three of us in the whole cabin, and economy was only about a quarter full. I’d have complained too if I’d had to queue or it hadn’t been kept clean.